There is skiing on Ventoux? Honestly - I didn't know. 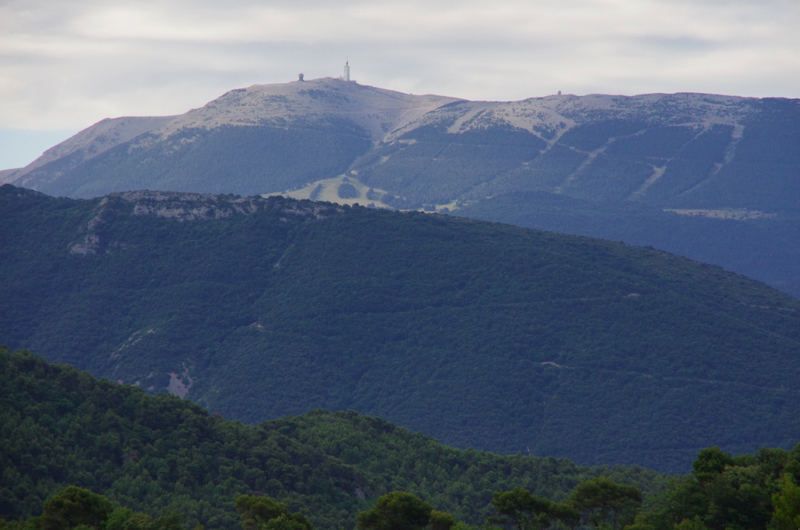 A view this morning of the northern side of Mont Ventoux. Visible is the road from Malaucene to the summit of Mont Ventoux, you can see the road traversing to the top and the ski runs. This is the Mont Serein Station de Ski at 1445m. There are three approaches to the summit of Mont Ventoux, 1) Bedoin to summit (the more traditional route), 2) Sault to summit (my favorite route which begins through lavenders fields and a beautiful forest), and 3) Malaucene to summit (I have never been on this third route). I have heard some say that the descent off Ventoux from the Malaucene side is the best descent in France. Enjoy the Tour de France today, I cannot believe the number of riders who have pulled out of the Tour, I am sad to see Fabian Cancellara go, especially since I hadn't seen a glimpse of him yet, even though I saw nearly everyone else the other day in Macon. My one big time this year was seeing him before the Tour of Flanders, that will have to do. I hope he does well in the Olympics.